The big talking Penguin game. There's something fishy going on here, and that's exactly the way Penguin Pat likes it. 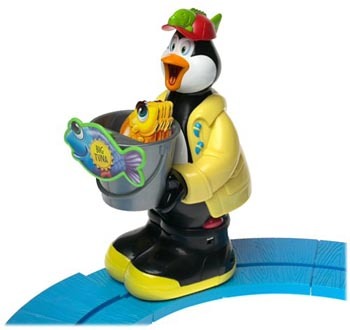 Youngsters, too, will net plenty of giggles with Penguin Pat's Fishy Business game from Milton Bradley. It's silly and simple fun as Pat waddles around the round, grooved track instructing players to add or subtract a fish from either his briny bucket or another player. The fish sport tail fins in four different colors, the catch of the day (and object of the game) being one of each. Complete a koi quartet, and you're the Big Tuna: Pat has a badge and a sing-along song for you. Players may want to adopt a house rule, such as Take from the front and return to the back regarding the fish in Pat's bucket, in order to keep the color of the next player's fish a deep sea-cret.